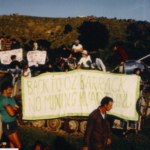 Local people from Karangahake and other parts of the Hauraki/Coromandel challenged miners from the 2018 AusIMM (Australia Institute of Metallurgy and Mining) NZ Branch Annual Conference who went to Karangahake to promote gold mining in the area – including on Department of Conservation land. Locals and visitors peacefully protested at the New Talisman mine site in the forest and challenged the miners at the entrance to the Windows recreational area. “ We did this to tell the mining industry they cannot mine in this forest, and call on the Government to urgently implement their promise to extend protection of the DOC lands as far south as Te Aroha. Right now the protection from mining on DOC land only applies to the northern Hauraki, Labour and the Greens have promised to extend it, with the Minister for the Environment repeating this last weekend at the Environment Conservation Organisations of New Zealand annual conference in Napier” says Watchdog Co- ordinator Augusta Macassay Pickard. Around a dozen people, including former Green MP Catherine Delahunty are occupied the mine portal and police were called. Five individuals from Karangahake and other parts of the Coromandel, including former Green MP Catherine Delahunty, were arrested [for occupying conservation land at Mt Karangahake]. They were peacefully protesting, highlighting that Conservation land is for the people, not for mining. They do not want this Australian company to come in here and mine, compromising their livelihoods, their water and their quality of life. 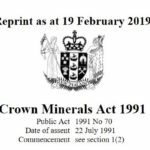 Coromandel Watchdog, together with other local groups concerend with previous attempts to establish mining on conservation land in the area, secured a commitment from the Labour and Green Party’s last year to extend the Schedule 4 [of the Crown Minerals Act] protection as far as Mt Te Aroha, thereby protecting it from mining. So far, there has been no movement by the Government to do this, despite that commitment. In the meantime, places like Mt Karangahake are being activily explored for gold, and the more time that passes, the more invested these companies become. Watchdog have said since this project was first mooted that mining this area is unacceptable, mining conservation land is unacceptable. The (now) Government agree with us, so how are these people still in our mountains, drilling and degrading them? We need action now, and we are having to go to extreme lengths to get it. We will continue our (peaceful) protests until it is all protected. “These people are on public land, doing their duty to conservation. The mining industry have more rights than the local community and the many thousands of visitors who are being blocked from this area so a foreign mining company can try and set up a gold mine on the heart of the mountain. The mining industry conference came here today to promote this area for mining; we have been proud to tell them loud and clear that toxic gold mining is unacceptable here. We urge the Government to action their promise of protection.The peaceful protests will continue in this region until toxic gold mining is stopped and the area is added to Schedule 4 of the Crown Minerals Act which protects land from mining”.